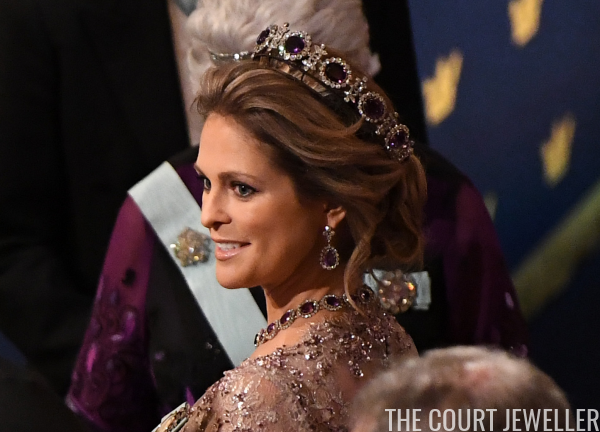 Princess Madeleine, who is expecting her third child, only attended one segment of the Nobel festivities this year in Stockholm -- the ceremony itself -- but we still got a good look at her jewels for the occasion. Madeleine wore jewels (tiara, earrings, necklace, brooch) from the family's magnificent parure of amethysts, which date to the Napoleonic era. Read more about the suite of jewels over here. 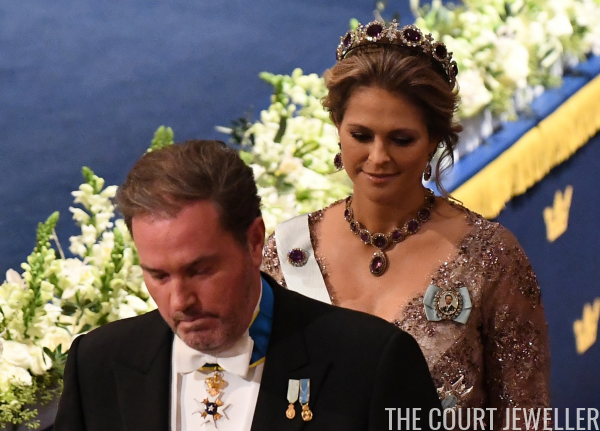 Here's a good look at the tiara nestled into Madeleine's hair. This circlet, which was made from a large necklace, is notoriously difficult to wear, as it can made the wearer's head look flat if it's not carefully angled. I think this is an especially successful outing for this particular tiara.